20 1/4 x 20 1/4 in. Dotty Attie is a modern painter, photographer, and printmaker born in 1938 in Pennsauken, New Jersey. Attie in particular is best known for her works involving the reappropriation of 18th and 19th century European and American paintings paired with text. The juxtaposition of these ornate snippets of neoclassical representation with plain text or neutral space works to expose the voyeuristic, hyper-sexualized Western conception of non-Western peoples and cultures. 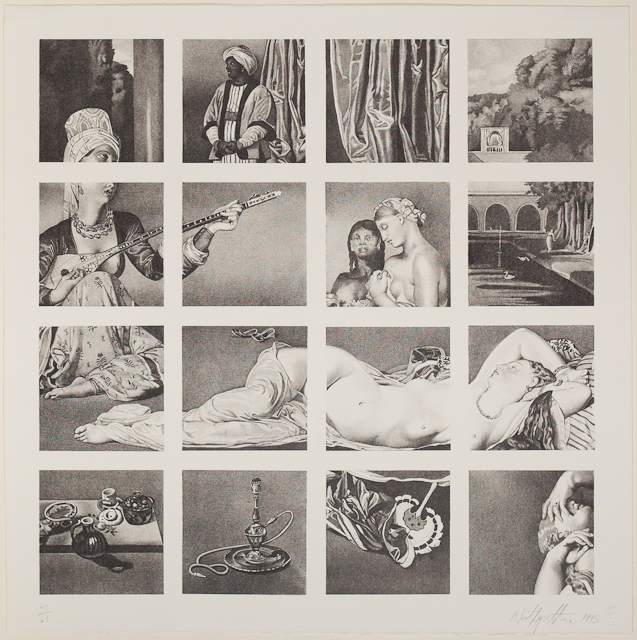 The works in Attie’s 1995 portfolio entitled Sometimes a Traveler/There Lived in Egypt place particular emphasis on the romanticization and exploitation of the bodies and the identities of North African women across neoclassical European art. Curated from the same series, Attie created this work by printing extracted sections of J. A. 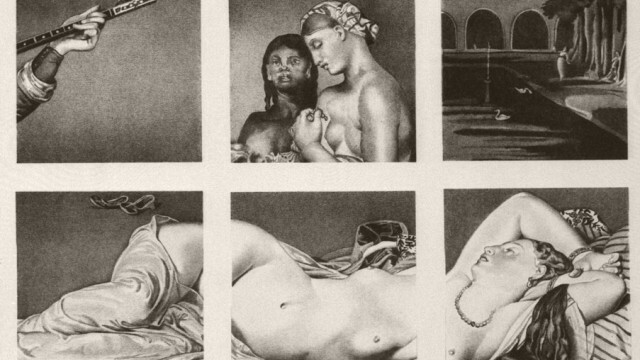 D Ingres’ Odalisque With Slave (1842) and Turkish Bath (1862). Attie collects from these works a harem of representations of exposed female bodies in relaxed positions, amongst other Western-conceived notions of Eastern pleasure and leisure. Both the women as well as the other figure are depicted as epitomes of Orientalist ideals. By presenting two of these female figures across multiple frames, Attie conveys the fracturing of their complete identity by Western artists into neat, objectified, and sexualized sections.